Comic Book Hoedown: Comic Books Aren't Just For Kids Anymore! That's Not Entirely a Good Thing. Comic Books Aren't Just For Kids Anymore! That's Not Entirely a Good Thing. This post is part of a larger series I'm writing this week talking about how the niche that the comic book industry has worked itself into is both the cause and the result of several other closely linked problems. If we want to see comics standing toe to toe with larger entertainment fields like TV, movies, videogames, novels, and music, we're going to have to face some unpleasant truths, and the companies are going to have to change how they do business. However, I fully believe this is something that can be done, and in a way that could see a population of millions of comic book readers by the end of the decade, if we get started soon. On Friday, I'll be presenting a possible solution, one which I think the major companies could implement relatively rapidly and inexpensively. However, I wanted to talk about some of the major problems first. Tuesday's post laid out the first problem: comics are expensive because they are niche, and comics are niche because they are expensive. For today's post, I'd like you to indulge me for a moment and cast your mind back to the 80s. I apologize to those of you old enough to remember them firsthand, as I know what I ask is painful. It will be worth it. Looking back, you can see an industry that was trying to find its way. It wanted to tell more adult stories, with intricate plots and visuals to back them up. A few creators began to leverage the new opportunities available to them and told stories that were less childish and more mature, while still retaining the sense of wonder that their audience was used to. As the decades wore on, some went off the rails a bit and began to tell stories that were "adult" only in the sense that you wouldn't want a child to read them, but many more created new and wonderful experiences for the audience that had grown up with their medium. Not content to preach only to the faithful, they also told many stories in that same medium for the children of their original audience. In case that last sentence hasn't already tipped you off, I'm not talking about comic books. I'm talking about videogames. The two industries share a similar path, in a lot of ways. At the beginning of the 80s, comics and videogames were both largely seen as children's fare. They both had simplistic stories and crude visuals. Then came the personal computing boom of the 80s. Adults began to play more games and demanded more mature entertainment. Some truly amazing games came out of this period, like Wasteland, The Bard's Tale, and the Ultima series, all of which told larger, more intricate stories. Similarly, in the rise of the direct market, we saw Watchmen, The Dark Knight Returns, and the beginning of what would turn into the Vertigo line at DC and the Epic imprint books over at Marvel. Today, there are more people playing videogames than ever before, across all ages. The videogame industry is worth over 100 billion dollars. Comic books... not so much. Why? The Batwoman comic is absolutely gorgeous. It has a wavy, undulating layout that makes the reader a little uneasy, as is appropriate, given the story it's telling. However, for a novice comics reader, particularly a younger one, it might be a little unclear the order the panels are supposed to go in. Should it be read across or straight down? There are visual clues to long-time comic readers, like the way the speech bubbles overlay panels and lead the eye to the next one, that make it clearer for them. The dialog explains very little of what's happening in the panel, instead offering context for it; the name of a victim, for example, or the name of a villain not shown. It's a very rewarding experience on every level for an experienced comic book reader, and even for a new reader that really dedicates some effort to trying to learn the visual language of the medium. It is worth noting, though, that the art on Batwoman is some of the best in the industry, and there are many others that try to create a similar flow for the reader to follow and fail miserably. 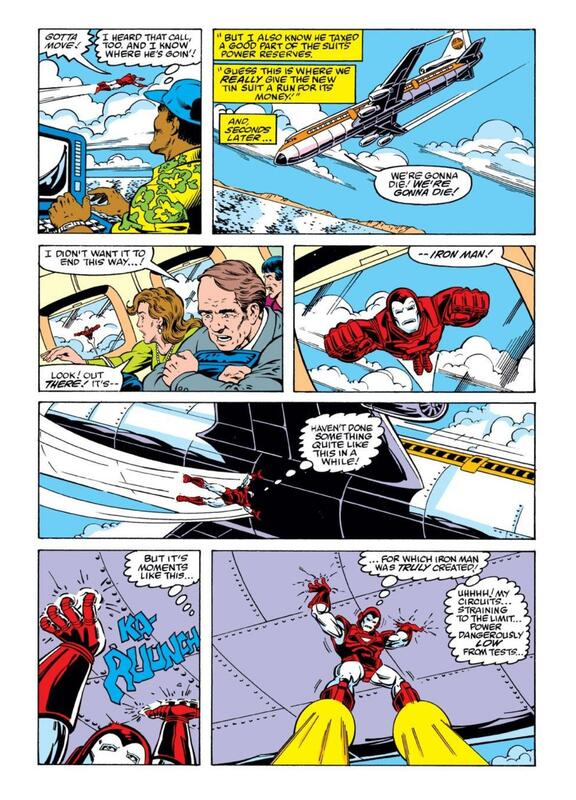 The Iron Man art, while fairly dynamic inside the panels, stays inside the panels. 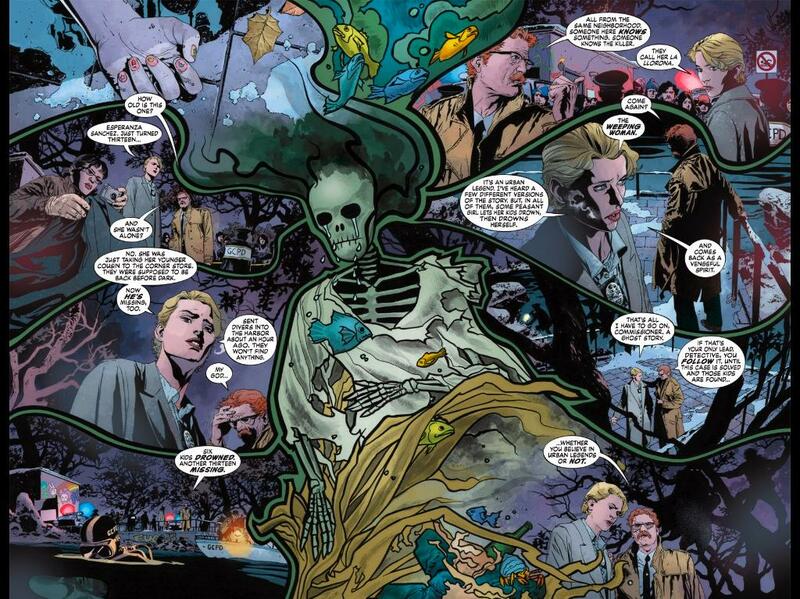 It's very clear to the reader which panel they should go to next and what the flow of the story is. It's a single page, so there's no question the reader should stay on this page, make their way through all of its panels, and move on to the next one. Speech bubbles and artwork stays within their own little boxes. The text explains what's happening if the art leaves any kind of doubt, and sometimes even if it should be clear to the reader. For an experienced comic fan, it's, well, a little boring. I'm still fond of it because I have a great deal of nostalgia of this era of comics, but trying to go back and read a lot of that material is not something I often do, because it does hold the reader's hand so much. You know what else bores me? Children's videogames. That's because they're not for me. They are designed to get kids used to playing videogames. I mean, they're there for the game creator to make money, of course, but they're designed to be simpler experiences that ease children into the concepts they'll need to play other videogames as they grow up. Compare, for example, Lego Batman to Batman: Arkham City. They're both games where you control Batman and take him around sections of Gotham City to fight the Joker and other villains while solving equipment-based puzzles to get further into the game. However, the gameplay in Lego Batman is far simpler, requiring little of the player. There are no counterattacks in the combat system, navigation is far more forgiving, there's no real stealth gameplay, and equipment usage is limited to one or two abilities at a time that change depending on the outfit the character is wearing. Hints are almost always on the screen, even if it's only to tell the user how they can use their current suit's ability. The story presented is a simple morality play that doesn't try to explore in-depth character motivations: the heroes are on one side and the villains are on the other. There's more comedy, and it's broader comedy. And it doesn't hurt that the Lego games are a bit less expensive than the Arkham games, so parents will be more likely to buy them. It makes for a better game for children that are just starting to learn the ins and outs of the media of videogames. And this brings us back around to comic books. The kid that plays Lego Batman is probably going to be the kid that grows up to play whatever the equivalent to Arkham City is 10 years from now. He's going to be a videogame player. His experience with the simpler gameplay and story of Lego Batman has trained him to enjoy the more complex Arkham game. He may even be a Batman fan. And yet, there's still a really good chance he'll never regularly read a Batman comic. Comic books used to teach kids how to read comic books. As the kids of the 70s, 80s and 90s grew up and wanted more and more sophisticated comics for their more sophisticated tastes, they began to shove comics that were kid-friendly, both in content and design, out of the marketplace. In the late 80s, there were a handful of PG-13+ comics available and dozens of PG or G rated comics, with design that largely matched the content's sophistication. Now that number has reversed. According to their website, Marvel is putting out 73 comics this month, including their Icon imprint. Of those, three are all ages books, and the rest are T+ or above, which is roughly equivalent to PG-13. To put that into perspective, imagine if Hollywood's output was 96% PG-13 and above. If you look at the other publishers, most of them put out even less all ages material. To be clear, I'm not saying we shouldn't have the mature material. It's great stuff, and it makes for wonderful reading. But in trying to get to the point where comics were respected as an artform, mistakes were made. Children were pushed out of the market with increases in price. The industry, afraid of being forced back into only making stories for children, reacted by making almost no stories for them. And, honestly, readers had a bit of a chip on their shoulders for the way that comic books had been looked down on for decades. We cut off our nose to spite our face, and now we don't have enough new, young readers coming in to do more than maintain and perhaps very, very slowly grow readership. The videogame industry manages to bring new gamers into the fold every year by continuing to make games not just for the dedicated adult gamer, but also for children. Unfortunately, because of the niche the comic book industry has worked itself into where it's so dependent on the direct market, there's not a lot of room on the shelf for inexpensive kid-friendly books that can train up a new generation of readers in the skills they'll need to enjoy the more mature books that make up the bulk of the market. Even for someone like me, a parent that wants to introduce their children to comic books, the opportunities to do so are scarce. And given that comics are really only available through the direct market, there are no opportunities for a young child to point at a Marvel Adventures or Tiny Titans book at the grocery store or gas station and ask their parents if they can buy it. Comic readers are getting older because comics are niche, and comics are niche because comic readers are getting older. That's two problems dissected, and one more to go. On Thursday, I'll be discussing the perceived lack of content diversity in comics, and then on Friday, I'll lay out a potential solution for much of what ails the industry. See you tomorrow!